Political allies who mostly stayed quiet about U.S. Rep. Jesse Jackson Jr. as he sought mental health treatment and stayed out of public view are speaking up about the congressman’s future. How Big is Illinois’s Lame Duck Class Going to Be? With 30 of the state’s 177 legislators not seeking re-election and every House and Senate seat up for election today, the General Assembly could have a huge lame-duck class this year. It’s likely that critically important issues, like pension reform, will be decided with help from these lawmakers, who can vote without fear of voter backlash. Not an especially courageous or smart way to govern. Ever wonder why you see the same names on the ballot year after year? Why there aren’t more legislative races that really are races? Chris Mooney, a faculty member at the University of Illinois Institute of Government and Public Affairs and a political scientist at the University of Illinois at Springfield, blames it on Illinois’ highly politicized system of drawing legislative maps. Do you know who is financing the candidates in your legislative district? Do you know who is financing the candidates in your legislative district? Check out this example from the newly drawn 96th Illinois House District, which includes parts of Springfield and Decatur: “Aided heavily by funds controlled by House Speaker Michael Madigan, D-Chicago, (Sue) Scherer was able to spend more than $237,000 on her campaign from July 1 through Sept. 30. Nearly $90,000 more was spent on her behalf for staff assistance, printing and postage. All but $2,600 of that came from campaign funds controlled by Madigan.” Illinois campaign finance laws allow legislative leaders to give unlimited amounts to House and Senate candidates. Thus targeted races can become proxy wars between leaders, and winning candidates arrive at the Capitol dependent on the caucus leader who financed his or her campaign. 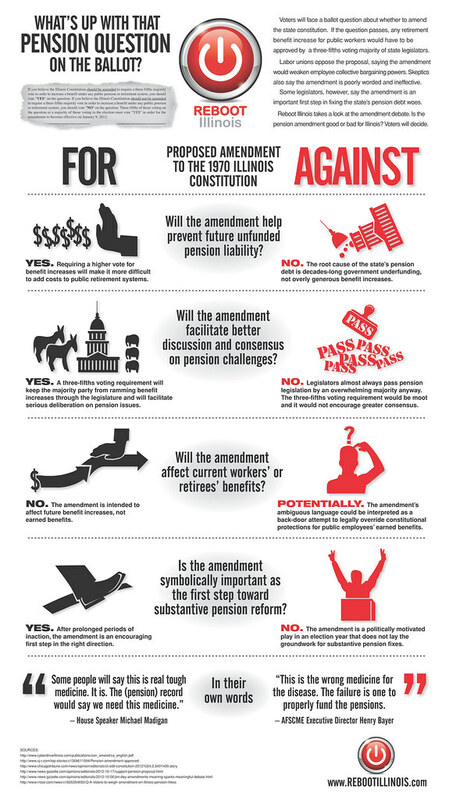 Ballot amendment 49: harmless gesture toward pension reform or sneaky ploy to slash retirement benefits for millions? The Chicago Tribune investigates. House Speaker Mike Madigan’s office clearly has no use for advocates of the latter theory: “”Those are legal minds that I wouldn’t hire to get me out of a traffic ticket,” says Madigan’s spokesman.